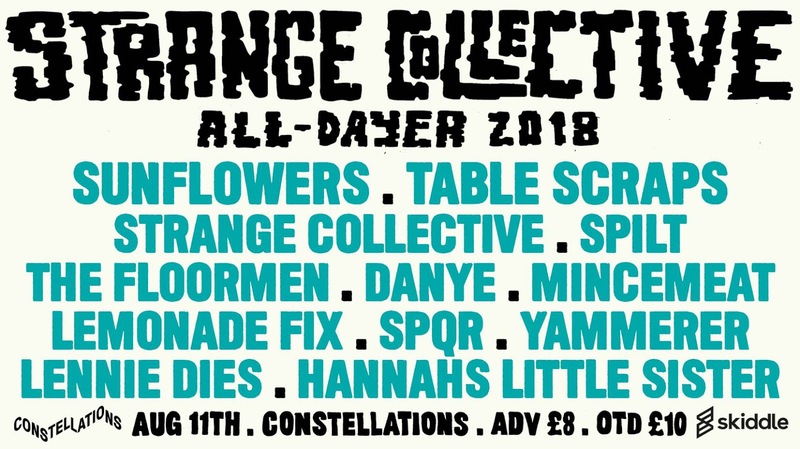 THE third Strange Collective all-dayer will be taking place at Liverpool's Constellations next week. Coinciding with the bands heavily awaited album and one year after the Super Touchy EP - the event on Saturday, August 11 will showcase some of Liverpool's best up and coming bands and artists who all offer a psych or garage theme. Unlike a lot of all-dayers, there will be no clashes and gig goers will be sure to find new talent slotted along some hotly-tipped names in the city's scene. DJ sets from Dig Vinyl and Bido Lito! will provide entertainment between acts while bands such as Table Scraps and Sunflowers will be travelling to Liverpool to spread their sound and forge a tight relationship with the music community. Local bands include The Floormen, The Lemonade Fix SPQR, Hannah's Little Sister, Lennie Dies and of course, Strange Collective. Along with music, Strange Collective frontman Alex Wynne has worked with local artist Jo Wilson to contact 12 creatives who will be allocated a colour and the name of one of the 12 acts performing and will be asked to create a piece of artwork on this information. The artwork will then be screen printed by Jo and Alex and sold at the event with the acts also receiving free copies of the print. Tickets are £8 in advance via Skiddle here www.skiddle.com/whats-on/Liverpool/or £10 on the door.